Wales Online, You Don't Know Us. "These women have different stories to tell, of inspirational people doing inspirational things. Sadly, they include the experiences of abuse or racism which have formed part of their lives. "But just as being Muslim is one part of their make-up, so is this: they are brilliant Welsh women doing wonderful things." Guardian, ‘The Tories are institutionally Islamophobic’: Miqdaad Versi takes on MPs and the media interview/opinion: "The 33-year-old Versi is a privately educated Londoner who graduated in maths from Oxford university. He is handsome and smiley and could pass for a dishevelled Louis Theroux. He talks fast, constantly gesturing with his hands and nodding. But his arguments are always fair, balanced and evidence-based. Versi is famously polite and relentlessly reasonable. Over the past three years he has become a brilliantly effective media whisperer – cajoling rather than bullying newspapers and broadcasters into seeing the error of their ways." Mirror, Birmingham mosque attacks: Five holy buildings vandalised 'with sledgehammers' "The terrified Birmingham Muslim community is linking sledgehammer attacks on five mosques around the city overnight to the deadly New Zealand terror massacres." Dazed, Young British Muslims are demanding the government tackles Islamophobia now "Political and faith leaders gathered in solidarity on Monday (March 18) in London’s Regent’s Park mosque to discuss the reality of Islamophobia in the UK. London mayor Sadiq Khan joined the panel with home secretary Sajid Javid, communities secretary James Brokenshire, the archbishop of Canterbury Justin Welby, and chief rabbi Ephraim Mirvis." Video from the Naz Legacy Foundation. Guardian, Inside Cambridge’s new £23m mosque: a forest runs through it "The new £23m mosque in Mill Road, Cambridge, which will open in the next few weeks, is the most determined attempt yet to build in a way that is of its own place and time. It’s the brainchild of Timothy Winter, also known as Abdal Hakim Murad, a convert to Islam who teaches at the University of Cambridge and is dean of the Cambridge Muslim College. The building, which has room for 1,000 worshippers, will serve the city’s Muslim population in general, as well as Winter’s students. " The project has used social media to publicise its building/funding. Details are here: Cambridge Mosque Project (Twitter). Cambridge Mosque Information . Cambridge Mosque Trust (website). 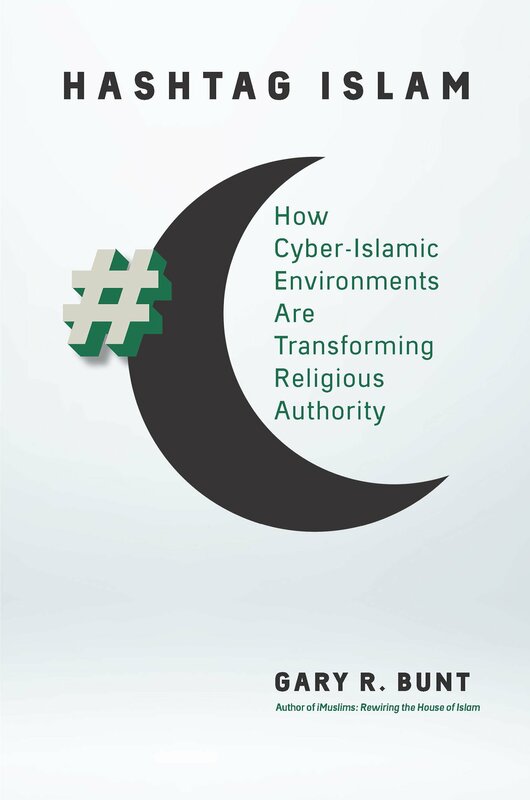 Gary R. Bunt's latest book 'Hashtag Islam: How Cyber Islamic Environments are Transforming Religious Authority' is published by the University of North Carolina Press, with a South Asia version available from Pentagon Press. Visit the Hashtag Islam page on VirtuallyIslamic.com for more information, including early reviews. Publishers Weekly, Understanding Islam...With Books includes reference to 'Hashtag Islam'. This blog is a series of feeds and links to information relating to Islam and Muslims in Britain. It's part of virtuallyislamic.com. Earlier feeds in the Virtually Islamic blog on related areas can be found here. Follow my Twitter feed (@garybunt) here for regular updates on blog posts. I'm also active on Facebook. Some of the blog's content links into the MA Islamic Studies (by distance learning) at the University of Wales Trinity Saint David (previously the University of Wales, Lampeter) - specifically the Islam Today module. It also links into my level 5 undergraduate module Islam in the West. I also work in related areas as a Director of Studies for Taught Masters Programmes . Inclusion of headlines, links and comments does not imply endorsement by Gary R. Bunt. Links are for information purposes only. © Copyright, Gary R. Bunt, 2012. Awesome Inc. theme. Powered by Blogger.